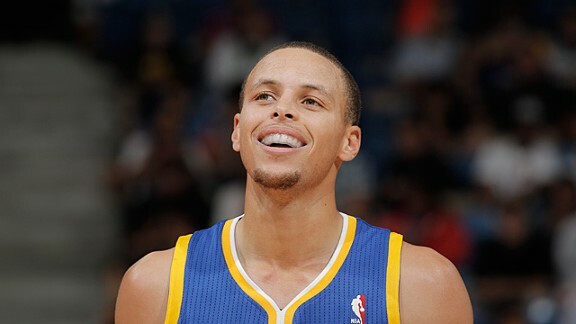 » NBA Shootaround: Season Predictions! So much amazing is happening, and the Shootaround crew is here to help you keep track of it all. Here, we make some predictions about the coming NBA season, ranging from the well-founded to the outlandish. Welcome to my island of asinine predictions, where I base outlandish claims on very brief NBA preseason YouTube highlights. Your room is ready for you. From this island, I can see, off in the distance, a place where we talk about Rajon Rondo as an MVP candidate. I don’t think he’ll win it — I don’t think anyone besides LeBron or Durant can — but I think he’ll be in the conversation. We’re going to be talking about Rondo in a new way this year. I have no doubt there will be moments when he is a petulant, distant, and sometimes awkward presence — the one we’ve come to know, love, or hate over these last few years. But reports coming out of Celtics camp fill me with nothing but where’s-my-fainting-couch anticipation. Rondo organizing offseason flag football games for his teammates? Because he “wanted to take everyone out there, so we could play together, get a little chemistry before we start and have a little fun”? Who is this guy? And when can we go play paintball together? What? KG-to-Rondo handoff into baseline yam job? We’re doing that? Wonderful! New day, new season, new Rondo. The almost-MVP. Only four players (Bill Russell, Wilt Chamberlain, Kareem Abdul-Jabbar, and Michael Jordan) have won at least four MVPs. LeBron is a favorite to claim his fourth and join that upper, upper echelon, but I see Chris Paul making a legitimate run at the award this year. Paul is surrounded by the most talent he has had in his entire career, with the addition of Jamal Crawford and an improving Eric Bledsoe. We’ve seen what Paul is capable of almost by himself in New Orleans, and he finished third in MVP voting during a feeling-out season with the Clippers. There is no one I’d want more with the ball in the closing seconds of a tight game, whether he is shooting the rock himself or creating for someone else. That is a clear characteristic of an MVP. Honestly, I don’t know if this will happen, but I kinda hope it does. Watching Kobe jack up 25 to 30 shots a game on this team would confirm his status as the greatest NBA 2K player ever. The weird thing about Kobe this year is that he doesn’t have a set role. Remember “Kobe the Facilitator”? The only way a coach can get Kobe to do anything but go full-bore Kobe is to give him a cute title and impress upon him constantly that this is a good idea. 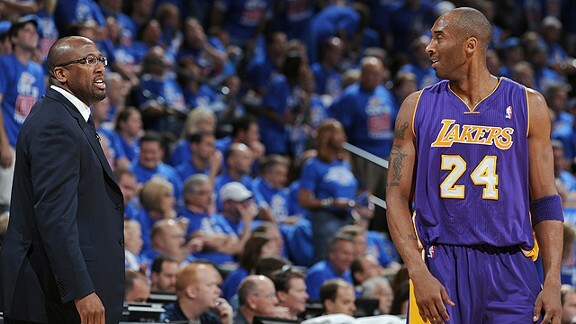 So what is Kobe’s role this year? “Kobe the Attacker”? Well, he can’t really attack the rim in the same way. “Kobe the Facilitator II”? Tough with Steve Nash on the team. “Sometimes Mamba”? Can you really see this happening? Isn’t it more likely that when the Lakers struggle at the start of the season (and they will), Kobe will decide to patch things up by “taking over” for long stretches of the game? He’s coming off a season when he led the league in usage percentage by a wide, wide margin. 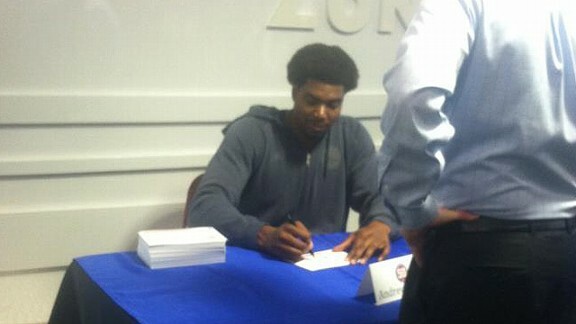 Andrew Bynum will play 30 minutes in a game before he gets a hair cut. Maybe this is more of a wish than a prediction because (a) “Andrew Bynum hair” is currently my favorite Google image search, and (b) I cannot wait to watch the Evan Turner–Andrew Bynum relationship develop on the court. For now, at least, we have Turner delivering periodic updates on their friendship via Twitter. Speaking of which, if anyone has photos of their joint birthday party, please hit me up. I was prepared to further a very important narrative cliché in this space: Danilo Gallinari is in the best shape of his life! So he will excel. Then he twisted his ankle. Again. Now he may miss the season opener. This always happens to Gallo, the Italian maestro as quick with his release as he is with a Kardashian rebuff. He tantalizes with an inside-out game, scrapping more than conventional wisdom would suggest despite possessing the back of a homeless merchant marine, all while doing things like this, my single favorite basketball play of 2011-12. So he’s hurt again. He’s always hurt. I DON’T CARE. For the first time in my life, my heart is with the Denver Nuggets. I love Ty Lawson. I want to conduct a Frost/Nixon–style series of interviews with JaVale McGee. I want to produce a remake of Suburban Commando starring Kenneth Faried. I want to watch Kosta Koufos and Timofey Mozgov share a Scorpion Bowl at Trader Vic’s. This team excites me, and sure, that’s already a hipster trope. DOESN’T MATTER. And sure, they’ve got more than a few wings who will eat up the Rooster’s minutes (Wilson Chandler, Andre Iguodala, Alex English, Corey Brewer, Peter Forsberg, Quincy Miller, Sgt. Nicholas Brody, Anthony Randolph, Bruno Mars, Evan Fournier, Pat Kiernan, etc.). DOES. NOT. MATTER. Something is inside of Gallo, something I watched closely when he was a member of the Knicks. I over-invested then, and I’m not ready to cash out. So Gallinari is going to the All-Star Game this year, behind a 31-20 start for the Nuggets. And then, after a chance encounter at Beta Nighclub, Denver’s premier danceteria, where the heat lamps are extra hot and the Calvin Harris is extra sticky, he’s going to kill love. Yes, Danilo Gallinari is going to break up the beautiful engagement of Broncos receiver Eric Decker and country music star Jessie James. Because he is a Rooster. And he crows. After being dismantled by the Spurs in the first round of last year’s playoffs, the Jazz looked like one of those humdrum teams trapped in the unappealing limbo between mildly competitive and rebuilding. Not so. They have two earthbound but foundational big men in Paul Millsap and Al Jefferson (playing for contracts no less), emerging frontcourt players in Enes Kanter and Derrick Favors, and a mix of useful veterans and young contributors. The West is brutal, but Utah will surpass expectations — with Corbin the beneficiary. Of course, this prediction gets defenestrated if they swing those expiring goons to a desperate challenger. Jimmer will get traded, Aaron Brooks will score 13 a game, and the Kings will win 30 games for the first time since 2008. I can’t tell if there’s a lot or absolutely nothing at stake for the 2012-13 Kings, but from what I’ve seen in the preseason (requisite caveats about the preseason), Sacramento looks like they might be figuring out how to use their disparate offensive weapons. Brooks only helps matters. There are lots of motivated guys in Sacramento who are either playing for huge deals or struggling to stay in the league and who will contribute to an encouraging season. I’m not saying the Bulls would’ve beaten the Heat, because I’m fairly certain they wouldn’t have. I’m just saying that I would’ve loved watching them try, and for those attached to defense and grit and all that, losing that team on a single play was a tough reality to face. What followed the early exit against Philadelphia was the reminder that nine months of Derrick Rose wasn’t the only thing these new Bulls would have to do without. Asik landed his deal in Houston, Kyle Korver was shipped off for cap relief, and both Ronnie Brewer and C.J. Watson were gone, too. Chicago managed without Rose last year because their second unit (Brewer–Luol Deng–Taj Gibson–Asik) was the best defensive unit in basketball. The Bulls didn’t score much in the second quarter, but neither did their opponents, with the Gibson-Asik duo accounting for a majority of the destruction. These Bulls are more of the Marco Belinelli–Nate Robinson–Nazr Mohammed sort. For as much love that remains harbored in my heart for Kirk Hinrich, and for as much respect as I can muster for Tommy Thibs, I’m ready for this team to devolve into the unwatchable until Rose is back in the fold. The worst part of it all is that I can only assume that less Asik means more Carlos Boozer, and more than anything else, that’s something I’m not prepared to deal with. So there ya go, my sort-of prediction for the year — if Carlos Boozer doesn’t kill me, he’ll only make me stronger. Or give me an ulcer. I’m not really sure. While this is a moderately bold prediction on my part, it’s also a huge cop-out, seeing as I’m not making a definitive claim on how good (or bad) either team will be. All I know is that my gut tells me Barclays will have more to celebrate than MSG, be it 2-seed versus 5-seed, 5-seed versus 8-seed, or the comical 9-seed versus 12-seed. The ideal situation for a high-drama guy like me is the first-round playoff bout, 3 versus 6, and given that the East is a complete crapshoot to predict with the seven best non-Heat teams capable of either being the 2-seed or missing the playoffs, it could easily play out in such a fashion. All I know is that it would delight my little heart to see a real rivalry develop between the two boroughs’ teams and for the first chapter of the story to be Brooklyn coming out on top. Who knows whether the Nets have the personnel and drive to be an elite team — they have both to be noticeably better than the Knicks. Larry Sanders is going to make his mark on this calendar year, somehow, some way. This dude just has a noisy game, and if he doesn’t get to show it in Milwaukee’s crowded frontcourt, look for some smart team to snap him up and find a role for him either midseason or over the summer. He has been a fringe rotation guy for most of his two seasons in the league, but when he gets on the floor, Sanders blocks everything in sight and figures into the calculus of every opponent possession. He blocked 9 percent of all opponent shots while he was on the floor last season, the second-highest mark in the league behind only Serge Ibaka, and one that blew away other players’ block rate. He also tried to fight the entire Indiana Pacers roster that one time. If Sanders can find minutes and some control in his game, he has a chance to be an important rotation piece on a good team — a difference-making defender. And even if he doesn’t, he’ll be entertaining along the way. His ankle problems have gone from weird to inexplicable to just depressing. I’ve followed the NBA for more than 30 years, which means I’ve spent the same amount of time defending it to all the people who insist the regular season doesn’t matter and that nobody needs to care until the playoffs start. I always thought that was a lazy argument, even when it seemed true. But as I look over the rosters of the elite NBA franchises, I find myself asking a disturbing question: Has the regular season ever mattered less than it does right now? In the East, Miami has the best team and the best player. No one disputes this. Even if they were devastated by mid-season injuries and limped into the playoffs at 41-41, they’d still be the prohibitive favorite (assuming LeBron was still LeBron). 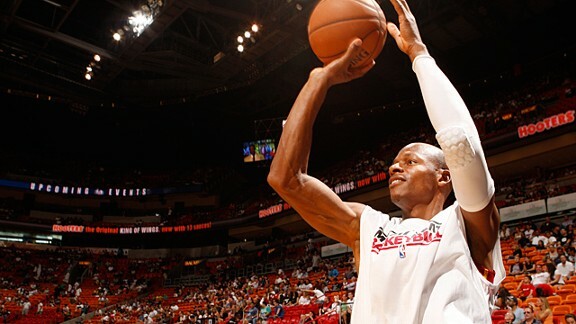 Until they reach the Finals, the Heat can only beat themselves. The second-best team is probably the Celtics, but everyone concedes they’ll proactively hit the air brakes in March to rest all their decrepit dinosaur bones. The Knicks and the Hawks (and maybe the Nets) will win between 40 and 52 games, but no one takes them seriously. The wild card is Chicago — but their best player won’t even lace up his Adidases until after the All-Star break. Derrick Rose won’t matter until the playoffs. The West is way more watchable (and more strategically compelling, in every possible way). I’ll watch every 10:30 game I can, purely for pleasure. But whatever happens in the regular season will indicate almost nothing about reality. The Lakers have the talent, but how often will we see their four best players on the floor, together, for more than 10 straight minutes? Not until May. Oklahoma City will likely take the no. 1 seed, but — with the loss of James Harden — they need to reinvent their half-court style and prove themselves all over again (in physical wars that truly matter). San Antonio is like Boston — they’ll concede games over the final weeks to stay fresh. Dallas is finished. The Clippers and the Grizzlies have a fixed ceiling and a limited future. Houston will be fun to watch, but nothing more. It’s a weird time to be an NBA fan: The sport is actively evolving into its own cynical cliché. The game we see in November is totally detached from the game we see in June. I still love it, but I can no longer defend it.